The GeoCareers website is a resource especially designed to provide students with information about careers based on the study of Geography at secondary school or a tertiary institution such as a university or college. The GeoCareers website is an initiative of the Australian Geography Teachers' Association (AGTA). helps you find the most appropriate place to continue your studies in Geography and select the courses relevant to your interests and planned career. 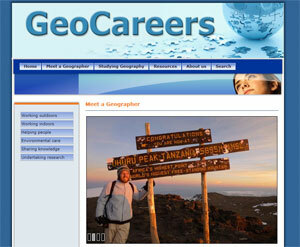 The GeoCareers website includes the following sections. People who have studied geography are highly sought after in a wide range of careers for the special skills and knowledge they bring. In this section you can read about the interesting and rewarding careers in which people who have studied are employed. Whether you are a secondary school student or enrolled in a tertiary institution such as a university or college this section will assist you find the right course for you. A range of resources that will help you make decisions about your future career include career pamphlets, destinations, online resources, geospatial careers, job search and volunteers. We welcome your suggestions and feedback to help make this website a valuable resource. Submit your comments to the website manager.